So yeah guys: I’ve been ill with a pretty bad cold over the past few days. The blame lies with twin sister Jas, who had it first, then so graciously passed it on to me. Thanks a heap, Jas. Just because we’re twins, doesn’t mean we have to share EVERYTHING. Not gonna lie, the past few days have been kinda miserable; I contracted the worst sinus infection, and as such was unable breathe properly through my nose- which is one of my BIGGEST pet peeves/irritations. My head felt like it was hit by a mallet from the pressure in my sinuses. I had to get up from my desk at work every five minutes to go to the bathroom to blow my nose (because I’m too self-conscious to do that in public). I also have the voice of a 20+ year chain smoker right about now. But rather than spend this post holding a personal pity party for myself, I decided instead to just stay positive and focus on the silver lining in the clouds. Maybe if I think on some of my favorite things, this friggin cold won’t seem so very bad. Favorite Food: Pancakes. Hands down. No competition. Favorite Day of the Week: Friday. (…Partyin, partyin’ yeah! Partyin’ Partyin’ yeah!) Am I the only one thinks of that darn crappy song at the very mention of the word? Favorite Movie: A & E’s “Pride and Prejudice” (Starring Jennifer Ehle and Colin Firth) This movie can literally make everything that’s going bad in my world suddenly feel fine. It’s just perfection itself. Favorite Thing to Wear: Loose fitting shirt with black yoga pants or leggings. It’s a look that can be casual, comfortable, and even cute. Favorite Book of All Time: This one is a tough one to narrow down, but I have to say it’s “Forever Amber” by Kathleen Windsor; this book is the best historical fiction I’ve ever read- and I’ve read a lot. I always read it at least once a year. I snatched it up. Daria’s dry wit was just classic. Favorite Weather: Blue/Gray sky with thick & fluffy clouds, where the temperature is around 60-70 degrees outside. It just makes the atmosphere seem so calm and mellow. Favorite Time of Year: November 1st-December 24th. Thanksgiving and the Christmas season is LITERALLY my favorite time to be alive during the year. I love the food, fellowship and celebrations that take place over both holidays. Favorite Reason For Laughter: An inside joke with me and my sisters. Some of the stuff we laugh over is just as random and crazy as we are. Favorite Music Genre: Classic Jazz. Ella Fitzgerald, Billie Holiday, Glenn Miller, Louis Armstrong, Frank Sinatra, Carmen McRae, Doris Day, Julie London, Nat King Cole, Dean Martin. Need I say more? Favorite Baby Names: Hannah Grace for a girl, and Michael Orlando for a boy. Favorite Super Hero: Batman. He’s a human with no supernatural powers, but he’s still big and bad enough to hang with the best of them. Favorite Fairy Tale: Rapunzel, with Rumpelstiltskin as a very close second. Favorite phrase: God Is in Control. I have to tell myself this maybe 50 times a day, and sometimes that’s still not enough. Favorite TV Series: I’m sorry. I cannot, CANNOT give just one answer to this…or two. Or three. Or four: Breaking Bad. Scandal. The Office. ER. Sons of Anarchy. House. Boardwalk Empire. Game of Thrones. Downton Abbey. House of Cards. With those choices, there’s no way I can pick just one winner. Favorite Rom Com: My Best Friend’s Wedding. I’ll never hear the song “I Say a Little Prayer” the same way again- and I’m totally okay with that. Favorite Vice: Extra dessert- even when I know I don’t really want/need it. Because, clearly that’s not the point. Favorite Thing to Make in the Kitchen: Bread. 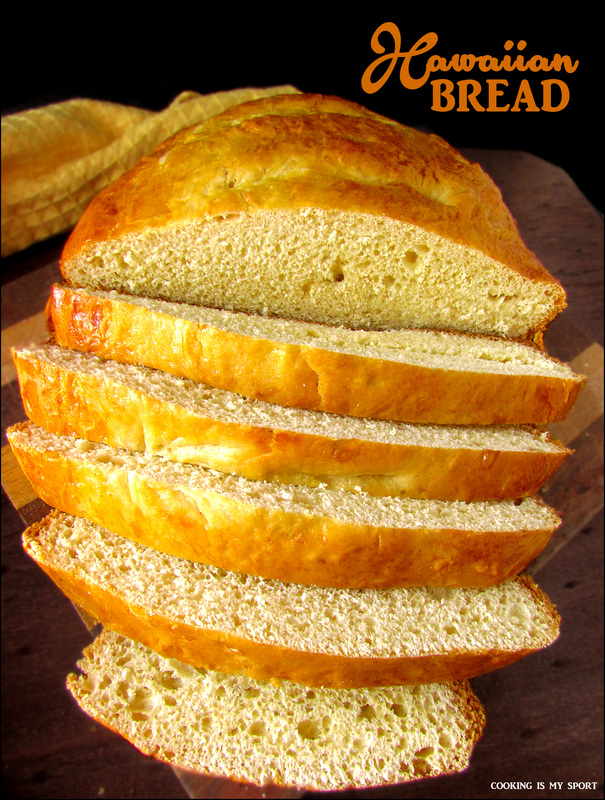 I can still remember the first time I was able to make from scratch, yeast bread all on my own. I was so proud of myself. To this day, making delicious bread still just makes me feel great. I did some reading up on this dish and apparently, Hawaiian bread actually has roots in Portugal as a sweet, egg based bread, then gradually migrated over to Hawaii where it became a trademark bread for both sweet and savory applications.Here in America, I generally see them in the well known Kings Hawaiian orange plastic wrapping. My grandma buys them a lot for holiday gatherings like Christmas or Thanksgiving. And because it’s something you can technically buy in the store, I of course am sharing a way that you can make it for yourself at home. Because that’s just how I roll. I’ve had this recipe bookmarked on my Allrecipes.com account for a long time now. Because I make it apart of my responsibility to make sure that my family always has bread to eat on the side at dinner, I needed a new one to make, and decided that this one would be it. It’s become another one of my Favorite Things. 1. 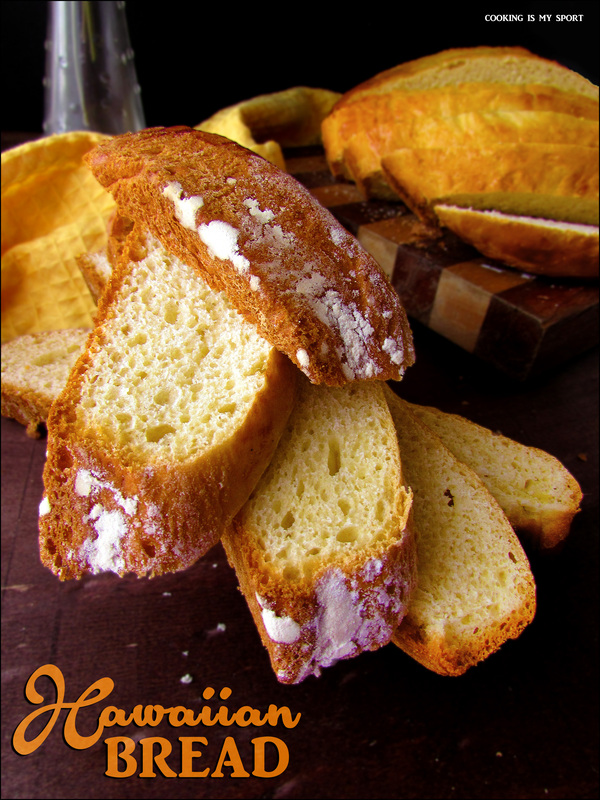 In a small bowl, dissolve yeast in 1/2 cup warm water. Let stand until creamy, about 10 minutes. 2. In a large bowl, beat together the yeast mixture, eggs, pineapple juice, 1/2 cup water, sugar, ginger, vanilla, and melted butter. Gradually stir in flour until a stiff batter is formed. Cover with a damp cloth and let rise in a warm place for 1 hour. 3. Deflate the dough and turn it out onto a well floured surface. 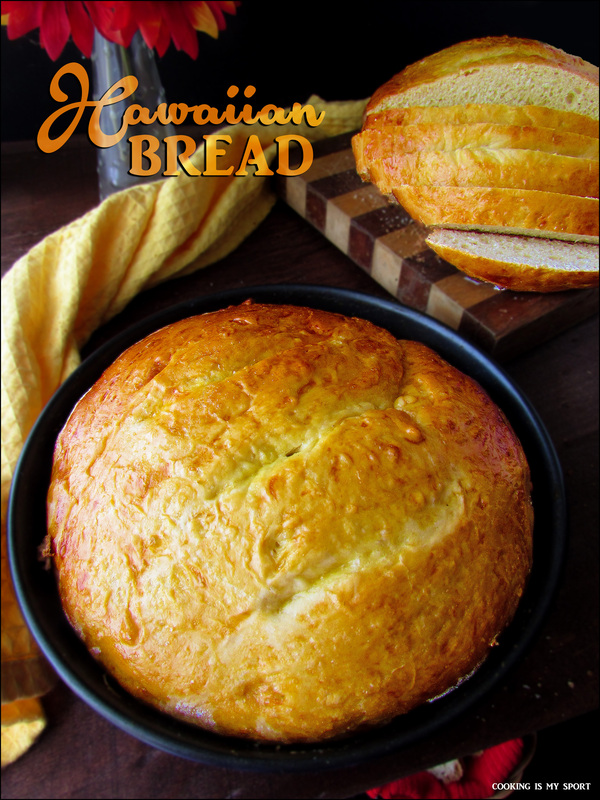 Divide the dough into three equal pieces and form into round loaves. Place the loaves into three lightly greased round cake pans. Cover the loaves with a damp cloth and let rise until doubled in volume, about 40 minutes. Meanwhile, preheat oven to 350 degrees F (175 degrees C). 4. 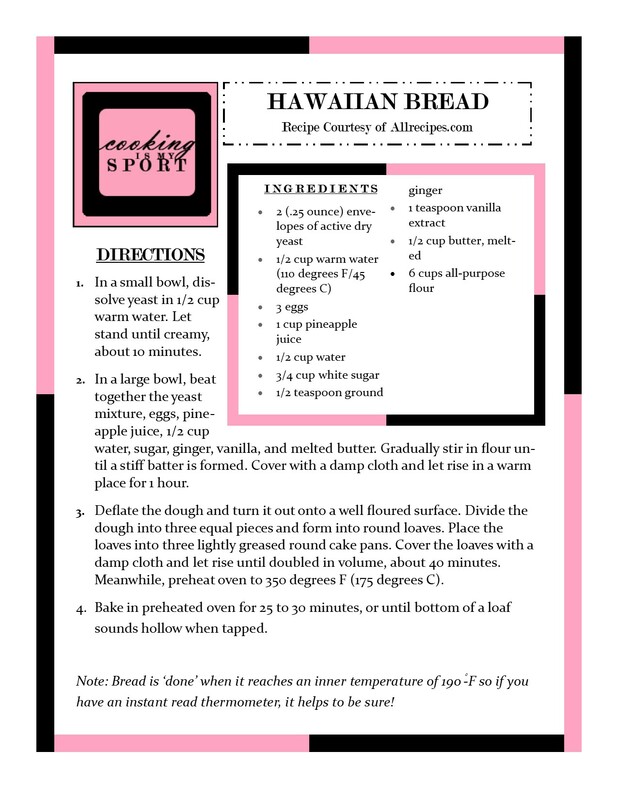 Bake in preheated oven for 25 to 30 minutes, or until bottom of a loaf sounds hollow when tapped. Note: Bread is ‘done’ when it reaches an inner temperature of 190°-F so if you have an instant read thermometer, it helps to be sure! Oven Baked Garlic Naan (step by step pictures)!! Wow looks so fluffy and soft….perfect. .. 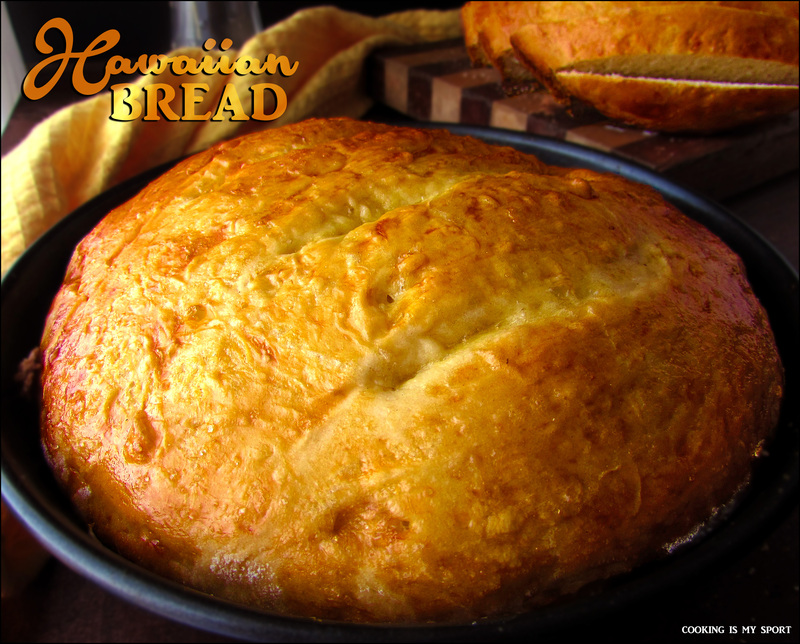 The pineapple juice gives it an unexpected, almost tangy sweetness, but it’s what gives it that distinctive ‘Hawaiian Bread’ taste too. Thank you! Looks great! 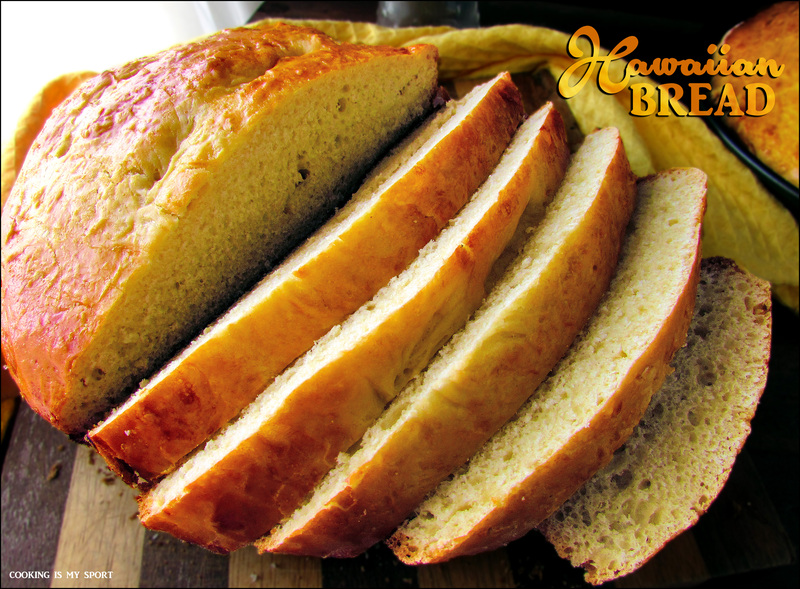 I love homemade bread, especially the yeast smell while it is baking. What a great alternative to the store bought variety. Ooo I so love it. That bread looks wonderful, I just want to take a bit. And by the way, is it possible to get a cold via the internet? I just read tons of post from people with bad colds, no person around me has one and this morning I woke up with the worst cold ever. It’s actually quite funny thinking about it… 🙂 Get well soon Jess! How can something look soooooooooooo good. Oh Jess, what would I do to be your neighbor. This one has surpassed all your other bakes. And it was interesting to read about you.